When faced with a challenging security issue, you need to see it solved quickly. At Tyco Integrated Security, our passion is to protect what matters most to our commercial business customers locally and nationally across Canada. Tyco Integrated Security is laser-focused on providing exceptional customer service and delivering high-quality, flexible security solutions to help protect our customers’ employees, assets and their bottom lines. Our operations in Canada have a national reach in all major cities and are an integral part of our broader North American business. We are ahead of the curve and committed to driving the future of security with intuitive solutions that are customized for our customers’ unique needs. 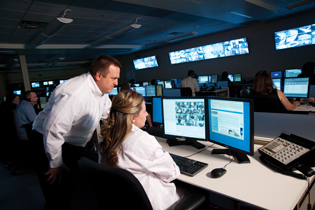 With world-class and redundant monitoring centres and thousands of qualified, highly skilled workers, we are North America’s leading provider in commercial security. We recommend that our customers perform regular and thorough risk assessments to identify threats and hazards and evaluate the vulnerability and potential consequences from an event to help understand and prioritize their risk mitigation and management strategy. security review, contact us today. © Tyco 2013. ALL RIGHTS RESERVED. Tyco is a trade/service mark of Tyco International Services GmbH and is used under license. All other marks are the property of their respective owners.